Some weeks doing any work at all seems to be hard. This has been one of those weeks. I have kept pace with the client schedule (just), but anything for myself has just felt like too much effort. I did put together the pattern for the Fehr Tade XYT work out top from the printed PDF file. Kudos to Melissa – this has to be the best matched PDF pattern I have stuck together so far. She has made joining marks on each sheet and every line seemed to just go together effortlessly. 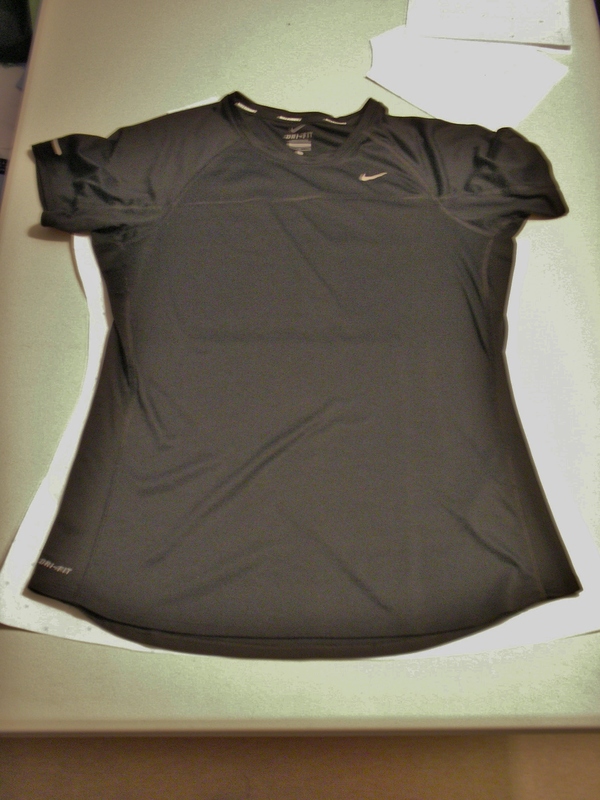 I have checked the pattern up against my favourite NIKE top for size and have made some adjustments which should help with the final fit, and lengthened the whole thing by 3″ as I like my tops long. You can see from the photograph that it isn’t far out from the favourite tops size, the bits sticking out should just about cover the seam allowances. I am still messing about with the built in ‘bra’ section. I am well outside the ‘B’ cup ideal so I know I should just make another piece with a dartless full bust adjustment before I cut out the power net. But not this week. I have even got as far as selecting some lycra fabric from my stash. It is a very tasteful very bright pink. Very bright. It will be perfect for one of the Race for Life events when it is done. I even have the black fold-over elastic as contrast. Very classy. However you will have to wait till next week for any progress as I have decided to have a sewing free weekend. BECAUSE IT IS THE LONDON MARATHON ON SUNDAY! My daughter will be running, along with (but not beside) Melissa, and Mo Farrah. And thousands of other people. Good luck to everyone who is running, or supporting, this weekend.